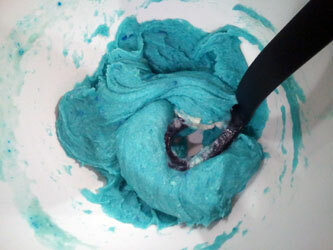 This is the easiest playdough recipe. Don’t want to cook your playdough? Don’t worry, we’ve got a recipe for that! This no cook playdough works nearly as well as cooked playdough and you don’t need a stove at all (well, you need something to boil the water on/in)! Be careful as it can be quite hot. This is as simple as a playdough recipe will ever get. Mix together and enjoy! This playdough recipe doesn’t end with you cooking it in a pan, you do however need boiling (or close to) water when making it. I began by collecting all the ingredients. 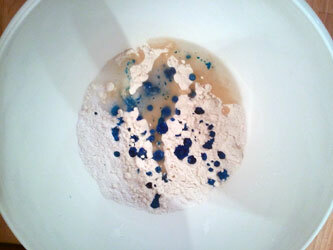 The flour, salt, water, oil, cream of tartar and food coloring. The food coloring is optional but it makes the finished playdough look more fun. 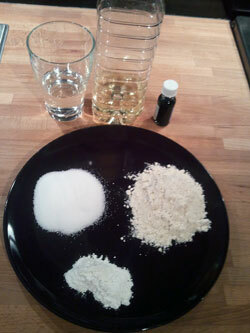 Pour all ingredients into a bowl, except for the water. Like the image below. When the water is boiling, add that too. You don’t have to be careful, just add all at once. After some initial stiring it will look like below. Looks a bit lumpy, but don’t worry, just keep stiring. 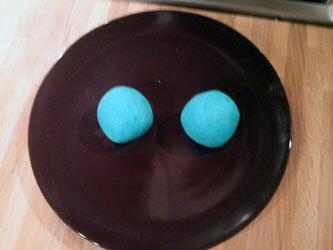 After some more stiring the lumps are gone and you should basically have some finished playdough. This attempt wasn’t 100% successful though, since the playdough is way too sticky. 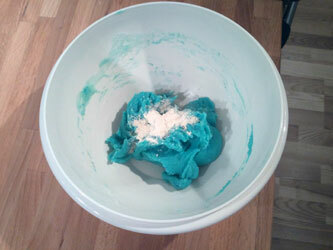 If you thought this batch of playdough was lost, think again, we can easily solve the problem with sticky playdough. We just add some more flour and knead for a few seconds. 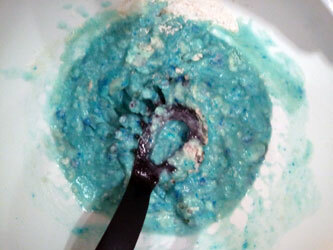 When the playdough is finished, it will look as blue and nice as the image below. Good luck! It look easy, before I found this recipe I use to make tortilla dough for my grankids. I’ve never tried tortilla dough, want to share? What does 1 cup mean? I don’t really bake so is it an actual drinking cup or what? Help!!!! No worries Marsha, I’ll explain. 1 cup is a common measure and it’s the same amount as 16 tablespoons. In 1 tablespoon you have 3 teaspoons. It sure is! Very simple but still a good playdough. is the cream of tartar neccessary or can the no cook mixture be made without it? I don’t think it will be very good without. 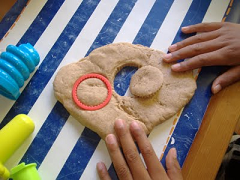 Cream of tartar makes the playdough elastic and “doughy”. Tried the Microwave recipie very fun and easy! I’m thinking this would be a quick recipe for me to whip up for a Sunday School craft. How long does it keep? How should I store it so the kids can work with it in a couple of days? Thanks! Keep it airtight in the fridge. It should be good for 1-2 weeks. As long as it smells ok and the texture is “playdoughy”. Wow! I’m so glad to hear! do you use cooking oil or vegetable oil? I’ve used vegetable oil, but both should do the work. Can you use an electric beater for tis recipe? I suppose so, but there shouldn’t be any need for it, since it’s very easy to knead. Does this playdough harden? I am looking for an easy inexpensive way to make sculptures at a child’s birthday party. Thanks! It does, but it will crack a bit. I wanted to use this in my class and was wonedring how to store the dough not in use. I’d like to make it the night before. If I put it in a airtight container/bag, will it last or does it need to go in the fridge? I tripled this batch and it worked out great! Then I made 5 triple batches…all of them turned out wonderful…separated them into 5 different colors and 40 different bags. Super recipe. I make play dough on a regular basis but have never used cream of tartar, it works both ways but I’m excited to see what happens when I do add it! I use my dehydrator and a spray sealant after they have dried for the “master pieces”. Cool! Could you add a link to the dehydrator and a spray sealant you’re using? Are you sure its 1 cup flour to 1 cup water? Mine was really watery. I had to add quite a bit more flour. otherwise turned out great. It’s always worked for me, but definately noted, thank you. Thank you so much! This is an awesome reciepe! I just made this and it took about 5 minutes! Works great! We keep ours in the fridge and it lasts over a month. Just made a few batches for my Daughter’s second birthday party and I know it will be a hit! Can you bake this afterwards to harden? I use my food processer to mix this all up and it just balls very quickly! I also use baby oil sometimes for a wonderful smell! Thank you so much this is a fun and inexpensive way to keep my 3 year old son busy 🙂 love it! I am in the Army and trying to do something new, budget cuts 🙂 . I need to make 20-30 LBS of playdough that will not dry or harden (reasonable life span of a month or so?). I will be using it to form 1.25 LB blocks for training aids. Any advice or suggestions? How do you store this play dough? can I ask if the dough getting wet and sticky after few days? What is the best playdough for baking in oven after they create? Personally I reckon the salt dough one is as it lasts better once baked.